The Product and offers you promote must align with what your target market wants in order to get sales that result in commissions. • You must be committed to making this business work. • You must also be able to handle outside distractions well. • Picking a niche you like will also make it easier to do research on the topic in question to improve your knowledge of the target market and the product offer. • Evaluate what gets you excited, what you talk about often with others, etc. • Use search tools at domain name registrars GoDaddy.com and/or Namecheap.com to find out what domain names are available and to register your preferred name. Select a quality Web host, such as HostGator.com or BlueHost.com, to host your site. A quality Web host is one with good uptime of your site, good customer support, and good reviews. Decide on how you will build your site – HTML (Hypertext Markup Language), WordPress, your Web hosting provider’s Web building software, etc. Learn how to use it proficiently and create your site. • ShareASale has two separate registrations for product vendors and affiliates. Providing extra bonuses differentiates your offer from other affiliates promoting the same product. Either create the bonuses yourself, use outsourcers to create them, or use quality PLR to create them. Try to make the bonuses relevant to the main product offer to add extra value that people will notice and be more enticed to click onto your link and purchase from you. Always strive to build @gmail.comyour email list, even in affiliate marketing. It takes an average of seven interactions for most people to buy anything from you online. This makes it vital to add these visitors to your opt-in list so you can follow up with them, build a relationship so they purchase products from your affiliate links. Use opt-in boxes on your site/blog, including review pages, etc., to get people to subscribe to your list. 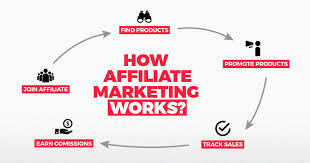 If you provide quality bonuses during affiliate commissions, people will be more eager to join your list and watch out for your affiliate promotions (i.e. purchase the offer via your link).